The noseband is a custom replacement for the rope nose that is buckled on the S Hackamore. It has the soft beta on the underside. The wire bit hobble has been replaced with beta. All sets are priced with the stainless steel English curb chain, as the original S.hackamore chains will rust. The stainless steel English chain length is also easier to adjust. The S Hackamore works well with the Deluxe Add-On headstall. This is a halter - bridle combination. We make it with a shorter cheek for use with the S Hackamore. This set is in glitter blue biothane over black beta, stainless steel hardware. Shown below is our S Hackamore with beta headstall and noseband. The headstall has shorter cheeks to accommodate the S Hackamore. The headstall has the sewn upper throatlatch that adds neatness and comfort. The noseband is a custom replacement for the rope nose that is buckled on the S Hackamore. We offer choices in noseband padding. Any color of biothane or beta can be used as the 1/2" top adjustable part. 1) 1" Soft beta on the underside. 2) The same as noseband (1) with black PVC padding on the underside. See below on red and black set. All sets are priced with ss English chain. The original chain that comes with s.hackamores will rust. The ss English chain is also easier to adjust the length. Ask about customizing, such as headstall width and custom sizing. Separate parts available. Please call if not listed. in brass or stainless steel. 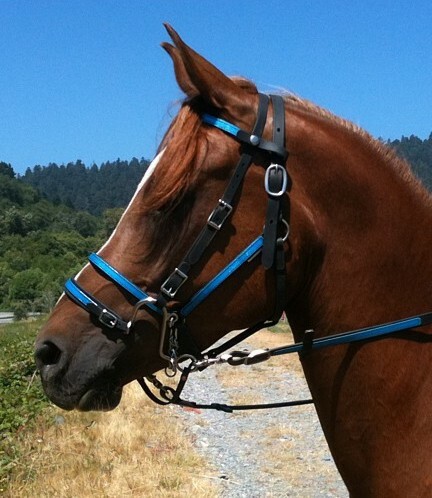 With beta noseband or PVC padded noseband. Color accents over black beta. Main page for information on S.Hackamore set with Horse Shoe Brand hardware.